In response to my recent article Faith Through The Lens of Natural Theology I received a great question from a friend on facebook. 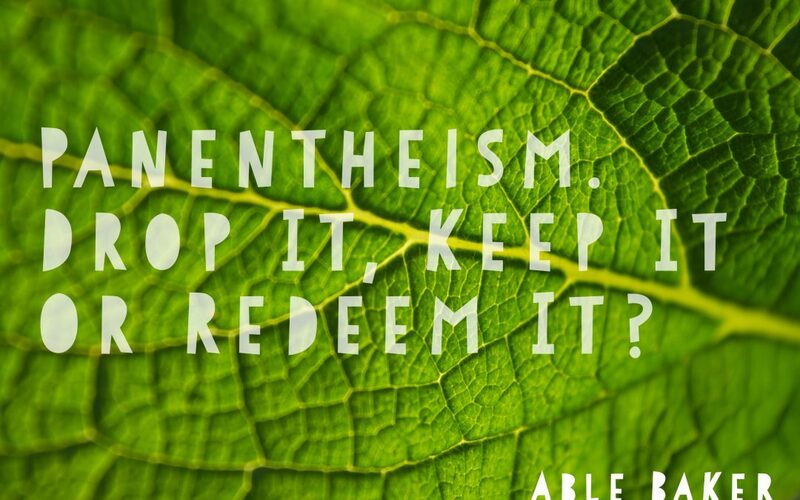 I think this topic is too important to just throw a quick reply back on facebook so I wanted to take a moment and write a quick article on the very relevant subject of Panentheism. In light our world’s desire to become more environmentally conscious and many evangelicals looking to put aside the old outdated idea that “God is coming tomorrow and he will just burn it all up anyways.” I think it is important to find some middle ground here. all (pan) in (en) God (theos). So the word is used to mean that all created things exist in (as in within) God. It is a step in a different and better (in my opinion) direction from Pantheism, which regards creation as a part of God. Pantheism And The Problem Of Idolatry. Though the word “pantheism” seems to have first originated in 1705 from an Irish deist named John Tolard the concept of created things being a part of god is definitely to greater and lesser degree a part of the conflict between Gods covenant people and their surrounding contemporary cultures in the Old and New Testament records. Because of humanity’s propensity to worship what they can see, touch and taste Paul addresses what is classically know, theologically speaking, as the Creature/Creator distinction in Romans 1:18-31. From this portion of Paul’s letter to the congregation at Rome we see that idolatry includes and exchange of the maker for what the maker has made. We find that at the very heart of this exchange is a human desire to be a god. In the over arching story of redemption as seen in Scripture (Creation, Fall, Judgment, Promise, Redemption, Restoration Consummation) God’s covenant people idolatry is always tied to some kind of exchange of what has been made for the one who has made it all. Pantheism has always been a problematic concept for most Christians to embrace in light of our desire to avoid idolatry. Though God is omnipresent, that is to say that He is present everywhere at the same time, God is also “wholly other” as in He transcends his creation as well. This mysterious paradox of God’s absolute transcendence and absolute imminence creates an important tension for Christians to keep. Does Panentheism Provide Us With A Safer Definition Of God’s Relationship To His Creation Than Pantheism? Prominent protestant theologian Jürgen Moltmann seems to hold to a somewhat revised form of Panentheism. His works The Crucified God (1974), The Trinity and the Kingdom (1981). Moltmann works toward a solution to what he perceives to be an arbitrary and because of that problematic view of creation among Christians. From what I understand of what Jürgen is saying seems a bit too idealized for me in an over realized eschatological sense. It pulls too much from the “not yet” consummation into the “already” present this is an important balance for me theologically. Heaven and earth are not yet one. What will this oneness be like? I don’t know. I am not a theological idealist in a George Berkley sense. I believe that actual physical matter exists and will always exist. I think the oneness that we will find in the restoration and consummation of all things “in” Christ is related to his Lordship and complete redemption from the old creation groaning under first, the loss of it’s original purpose for humanity as God’s image bearers and second, the fullness of creator God’s original blessing of goodness. I prefer “through him” or “by him” phrasing in the translation of Colossians 1:16-17 because I think it is a better representation of the passages immediate context concerning the restoration and handing over of creation back to it’s original owner Jesus. Jesus is the active agent in creation and it’s rightful Lord. So, Is Panentheism safer? Perhaps it is safer than Pantheism because it creates more space away from blatant idolatry. Jürgen Moltmann is a very smart and Godly man. It seems that he has redeemed Panentheism with philosophical and theological validity in a protestant sense by providing some needed nuance. But I am personally not comfortable with it from an exegetical basis and perspective and that is of chief concern for me theologically. Are there nuances of Panentheism that I apply or hold to personally? I do love God’s creation in a very real sense. I believe because of our brokenness separateness from the complete and full loving kindness of God we are unable to be the stewards of it that we ought to be and creation itself is unable to serve us in the sense that it was made for. Both of these realities stem from our loss of original blessing. I believe that waste and destruction are very real parts of what it means to be human until heaven and earth are one. We voluntarily and involuntarily destroy and misuse what God originally created for us. I am learning as I grow in (in a non Panentheistic sense) Christ that I can do more and more to show respect for God by loving all that he has created. I understand this stewardship in the sense that I am a part of the problem while I am a part of the solution (this ruins idealism for me because of my own hypocrisy). So I would not consider myself “anti fossil fuels” for example but I would consider myself pro responsibility. I am completely for growing toward responsibility regarding my relationship to all that God has created including myself. I consider love a deep and meaningful enough connection between God and creation. I consider love to be what God requires from me regarding his creation and perhaps in that sense a care for nature can be a conduit for worshiping Him. I can appreciate the results of Panentheism in a merely pragmatic sense. Care and love for creation is important. However as an evangelical from an exegetical first perspective I cannot find the support needed to consider something considered Panentheism to be something congruent with a Christian theology. Panentheism, should we drop it? Keep it? Or Redeem it? My opinion, for what it’s worth (haha), drop it.